You might think twice about buying produce from Japan’s Fukushima, where a tsunami-hit nuclear power plant spewed radiation. But what if it’s deluxe lettuce grown in a high-tech clean room? Fujitsu is hoping its digital lettuce patch, grown with the help of sensors and cloud computing, will catch on. The supercomputer maker is taking orders for its lettuce produced in a sterile facility once used to manufacture chips that went into mobile phones and other consumer electronics. The salad ingredient is the first in the company’s line of “Kirei Yasai” (Clean Vegetable) greens. The facility in Aizu-Wakamatsu, Fukushima, in northern Japan has about 2,000 square meters given over to plant production. Fujitsu said it’s the largest center of its kind focused on producing low-potassium veggies. The lettuce has 100 micrograms or less of potassium per 100 grams, according to Fujitsu, far below the typical amount of 490 micrograms. People with chronic kidney disease often have to limit their intake of potassium due to weakened kidney function, but have limited options among raw vegetables. Fujitsu believes its low-potassium lettuce is tasty enough to chow down on without dressing, and intends to target medical centers for initial sales. At roughly ¥500 (US$4.90) per 90-gram bag, the lettuce is about twice the cost of garden-variety sandwich filler found in Japanese supermarkets. But it was raised with the help of semiconductor know-how and cloud computing. Fujitsu Semiconductor’s experience with clean rooms was used to figure out the best growing conditions and how to control microorganisms. A food and agricultural cloud platform, meanwhile, was used to decide on the best atmospheric conditions such as temperature and humidity as well as fertilizer levels to achieve an optimum crop. Sensors along the rows of lettuce in the clean room gather data on how the lettuce is growing, algorithms analyze the numbers and recommendations on procedures such as harvesting time are sent to workers. “In 2009, after we ended semiconductor production in one of the three facilities at our Aizu-Wakamatsu plant, we wanted to utilize the available factory cleanroom,” said Fujitsu spokesman Rishad Marquardt. The Akisai cloud service is related to another IT farming project in Japan called Nosho Navi, coordinated by Teruaki Nanseki, a professor of agriculture at Kyushu University in southern Japan. Farmers in Shiga Prefecture near Kyoto have been using smartphones to upload data on rice paddy watering and other crop work to a cloud server that in turn suggests how much water to give each paddy and when to harvest the rice. The tool is seen as useful for younger, inexperienced farmers amid the greying of Japan’s population and shrinking labor force. 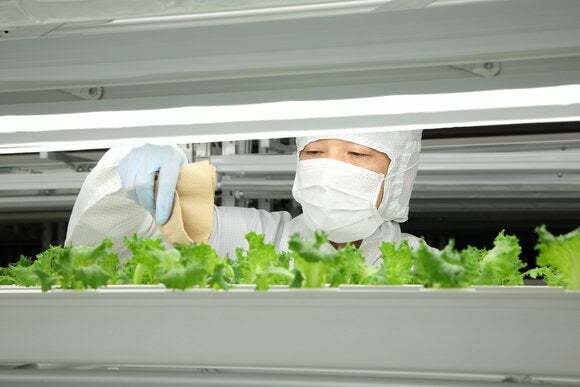 Fujitsu sees a green future in cloud-based veggies, and is aiming for ¥400 million in sales by the year to April 2017.